Why Nike, GameStop, and Five Below stocks could make big moves over the next few trading days. Stocks edged higher last week to help the Dow Jones Industrial Average (DJINDICES:^DJI) and S&P 500 (SNPINDEX:^GSPC) extend their 2017 gains of roughly 6% so far. Retailers will likely be some of the coming week's biggest movers as they reveal their holiday-season sales and profit results. The most anticipated quarterly reports ahead will be coming from Nike (NYSE:NKE), Five Below (NASDAQ:FIVE), and GameStop (NYSE:GME). Dow giant Nike announces its earnings results on Tuesday, at a time when investors are starting to feel more confident about its business. 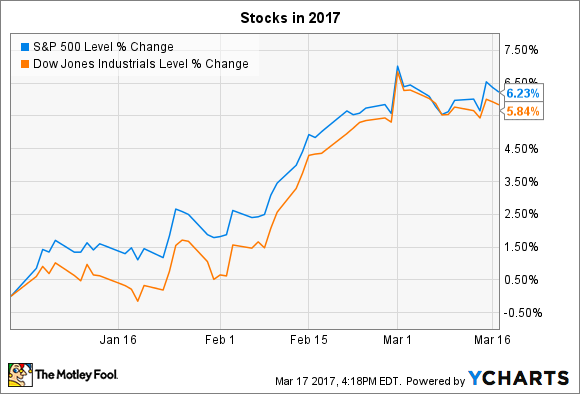 After finishing dead-last among the 30 Dow stocks last year, shares have modestly outperformed the broader market so far in 2017. Nike's sales growth has been slowing, dropping to 9% over the past six months compared to 12% in fiscal 2016, and 14% in the prior year. Its gross profit margin is also down significantly. Yet the company made good progress at clearing out excess inventory over the past few quarters, which suggests that an earnings rebound could be on the way. Still, rival Under Armour didn't provide an encouraging view of the industry in late January, when it missed its sales and profit growth estimates while citing weak demand in the U.S. market. With half of its business coming from international geographies (compared to 15% for Under Armour), Nike isn't nearly as exposed to soft U.S. trends. That's why investors are optimistic that the company will show progress toward rebounds in sales growth and profitability this quarter. Specialty retailer Five Below will post its holiday quarter results after the market closes on Wednesday. The stock has been stuck in neutral ever since the company lowered its sales and earnings outlook in early January, citing soft shopper trends. At the time, CEO Joel Anderson and his executive team projected that comparable-store sales likely increased by just 1% in the quarter, which would produce total 2016 sales of $1 billion, equating to 20% growth over the prior year. "After a solid start to the holiday season," Anderson explained, "we experience softness in mid-December, including Super Saturday, with sales accelerating later in the holiday season." Investors will be focused on how far actual results deviated from the company's January forecast. They'll also be keenly interested in profitability, since a gross margin decline would imply that customer traffic trends were surprisingly weak. Longer term, Five Below's 2017 forecast could send the stock sharply higher, or lower, if it predicts much change from the 2% comps increase it has averaged over the last year. GameStop is in a race against the clock. The company is working hard to ramp up new business lines such as consumer electronics, cellular service, and collectables merchandise, while the core video-game market on which it built its retailing empire falls apart. The strategy had been working well, and in fact, the company set a new record high for profits in fiscal 2015. But things haven't worked out nearly as well this year. Comparable-store sales are on pace to fall by as much as 12% in 2016. The company warned that falling store traffic and declining prices hurt software sales over the holidays. CEO Paul Raines and his team also noted a surprising drop in demand for gaming consoles. "During the holiday period, sales in the video game segment were impacted by industry weakness, promotional pricing pressure and lower in-store traffic, amid a difficult holiday season for many retailers," Raines said in a press release. Significant growth in the tech brands segment will likely soften the blow from gaming declines this week, but GameStop will still need to convince investors that it has a solid plan for returning to growth as its core customers shift their spending to online sales channels.